This article is about the direct-to-video animation studio. For the area in Disneyland Paris, see Toon Studio. For the main animation division of The Walt Disney Studios, see Walt Disney Animation Studios. Disneytoon Studios, originally Disney MovieToons and was also Disney Video Premieres, was an American animation studio which created direct-to-video and occasional theatrical animated feature films. 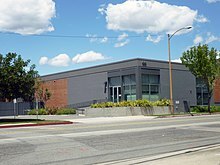 The studio was a division of Walt Disney Animation Studios, with both being part of The Walt Disney Studios, itself a division of The Walt Disney Company. The studio produced 47 feature films, beginning with DuckTales the Movie: Treasure of the Lost Lamp in 1990. Its final feature film was Tinker Bell and the Legend of the NeverBeast in 2015. Disney MovieToons' first feature production was DuckTales the Movie: Treasure of the Lost Lamp in 1990, with animation by Walt Disney Animation France. Disney Television Animation hired director of specials, Sharon Morrill, in 1993. Disney began producing direct-to-video sequels of Walt Disney Feature Animation films: the first of which was the Aladdin (1992) sequel The Return of Jafar (1994). When Aladdin was selected as a possible candidate as an animated TV series (before the film's release), as with many animated series, the first three episodes were a multi-part story which Disney used as a potential "family movie special" for the Friday night before the series' premiere. The opening story was instead greenlit for a direct-to-video release. Thus with The Return of Jafar and its success, the direct-to-video unit was started. Then a second sequel, Aladdin and the King of Thieves (1996), assigned work to both the Australian and Japanese animation units. In August 1994 with the departure of Walt Disney Studios chairman Jeffrey Katzenberg, its filmed entertainment business was split into two, with this division moved as a part of Walt Disney Television Animation into the newly created Walt Disney Television and Telecommunications under chairman Richard H. Frank. Morrill was in charge of the above first Aladdin DTV film, launching Disney Video Premiere. Morrill expanded the DTV market making it more important for Disney, thus the overseas Disney studios were increased and assigned to these features. Morrill was promoted to vice president of the direct-to-video unit by November 1997. The Walt Disney Television group, upon the departure of its president Dean Valentine in September 1997, was split into two units, Walt Disney Television (WDT) and Walt Disney Network Television (WDNT), reporting to Walt Disney Studios chairman Joe Roth. WDT would be headed by Charles Hirschhorn as president and consisted of Disney Telefilms and Walt Disney Television Animation, which included including Disney MovieToons and Disney Video Premiere. The unit released a short under the WDTA name in 1997, Redux Riding Hood, which was nominated for a 1998 Academy Award. More direct-to-video sequels followed, among them Beauty and the Beast: The Enchanted Christmas (1997), Pocahontas II: Journey to a New World (1998), The Lion King II: Simba's Pride (1998), and Cinderella II: Dreams Come True (2002). By April 1998, MovieToons was merged with the units of direct-to-video films and network TV specials as Morrill was promoted to executive vice president over her existing unit of DTV films, network TV specials and theatrical films. Ellen Gurney was promoted from director of DTV films, theatrical movies and specials to vice president in April 1999. In a January 2003 reorganization of Disney, Disney MovieToons/Disney Video Premieres was transferred from Walt Disney Television Animation to Walt Disney Feature Animation and renamed Disneytoon Studios (DTS) in June. Morrill continued to lead the division as executive vice president. With the split, both Disneytoon and Disney Television Animation were issuing direct to video features. Disney closed Disney Animation Japan, one of the two remaining internal overseas studios Disneytoon worked with, in June 2004, with Pooh's Heffalump Movie (2004) as its final DTS work. By March 2005, Morrill was promoted to president of Disneytoon. On July 25, 2005, Disney announced that it was closing Disneytoon Studios Australia in October 2006 after 17 years of existence, with its final feature being Cinderella III: A Twist in Time (2007). In the early 2000s, Disneytoon joined Disney Consumer Products (DCP) as their internal video partner within the Disney conglomerate in developing the new Disney franchises, which then only consisted of Disney Princess and Disney Fairies. While DCP eyed other potential franchises, DTS looked into the Seven Dwarfs for a male-centric franchise to counterbalance the female-centric Fairies by 2005. John Lasseter joined Disney with the purchase of Pixar in 2006, and made it clear that he disliked Disneytoon undercutting the value of the feature animated films with the sequels and prequels. Following complications relating to the production of Tinker Bell (2008), the debut film of DCP's Fairies franchise, it led to discussions over the focus of the division. Thus, Sharon Morill, president of the studio, moved to a new position in the company. On June 22, 2007, management of Disneytoon Studios was turned over to the control of Alan Bergman, president of Walt Disney Studios, with input from Ed Catmull and Lasseter. As chief creative officer, Lasseter called for the cancellation of all future films in production or development at Disneytoon Studios. As a result, planned or in-progress sequels to Chicken Little (2005), Meet the Robinsons (2007), Pinocchio (1940), and The Aristocats (1970) were all cancelled, among other projects. Tinker Bell's animation was scrapped and was restarted while two projects that DCP formed as franchise projects were canceled, which were "Disney's Dwarfs" and the Disney Princess Enchanted Tales line after the latter's first DVD. The release of The Little Mermaid 3 was put on hold. Disney Studios president Alan Bergman went to oversee day-to-day operations of DTS. Thus DTS halted production of sequels and prequels when it originally indicated that the division would shift to support various Playhouse Disney franchises with direct-to-videos. Meredith Roberts transferred from Walt Disney Television Animation to senior vice president and general manager of Disneytoon Studios in January 2008. At the April unveiling of Disney's animated feature lineup, it was announced that Disneytoon Studios would no longer produce future sequels to Disney animated films, but will instead focus on spin-offs. Also, the division was under the banner of the renamed Walt Disney Feature Animation studio, now called Walt Disney Animation Studios, led by Catmull and Lasseter. In November 2017, Lasseter announced that he would be taking a six-month leave of absence after acknowledging "missteps" in his behavior with employees in a memo addressed to the staff of Disneytoon Studios, Walt Disney Animation Studios, and Pixar. According to The Hollywood Reporter and The Washington Post, Lasseter had a history of alleged sexual misconduct towards employees. On June 8, 2018, it was announced that Lasseter would leave Disney Animation and Pixar at the end of the year, but would take on a consulting role until then. Disneytoon Studios was shut down on June 28, 2018, which resulted in layoffs of 75 animators and staff. The production company's untitled Planes spin-off film about the future of aviation in outer space was removed from Disney's film release schedule of April 12, 2019 and was removed from development. As of 2002, the films that Disneytoon had made often had budgets less than $15 million for production, and had taken in $100 million in sales and rentals. ^ a b c d e f g Baisley, Sarah (June 21, 2007). "Disneytoon Studios Prexy Morrill Steps Down". Animation World Network. Retrieved April 19, 2012. ^ a b c Desowitz, Bill (June 28, 2018). "Disney Shuts Down Disneytoon Studios in Glendale: Exclusive". IndieWire. Retrieved June 28, 2018. ^ a b c d e f Graser, Marc (August 11, 2014). "Layoffs Hit 'Planes' Producer Disneytoon Studios". Variety. Retrieved August 12, 2014. Of the 60 employees on staff at the Glendale, Calif.-based division of Walt Disney Animation Studios, 16 are being affected by the layoffs and started to be told of the reductions last week, individuals close to the situation confirmed to Variety. ^ a b Ball, Ryan (January 30, 2008). "Disney Snags Nick Exec Coleman". Animation Magazine. Archived from the original on August 25, 2013. Retrieved June 13, 2015. ^ a b c Harrington, Richard (August 7, 1990). "'DuckTales: The Movie'". The Washington Post. The Washington Post Company. Retrieved February 27, 2013. ^ a b c d e f g h i j k l Baisley, Sarah (June 16, 2003). "Disneytoon Studios Builds Slate Under New Name and Homes for Needy". Animation World Network. Retrieved February 26, 2013. ^ a b c d Olson, Eric (April 27, 1998). "Disney ups TV animation duo". Variety. Cahners Business Information. Retrieved September 16, 2015. ^ a b c d e f g h i j k Strike, Joe (March 28, 2005). "Disney's Animation Cash Crop — Direct-to-Video Sequels". Animation World Network. Retrieved March 9, 2013. ^ Weinraub, Bernard (August 25, 1994). "Chairman of Disney Studios Resigns". Los Angeles Times. Times Mirror Company. Retrieved April 28, 2014. ^ a b c d e f g Hoffman, Ilene (November 1997). "Buena Vista Home Entertainment: A Very Lucky Accident Indeed". Animation World Network. Retrieved March 9, 2013. ^ Hofmeister, Sallie (September 17, 1997). "Disney Splits Television Group Into 2 Units". Los Angeles Times. Times Mirror Company. Retrieved April 28, 2014. ^ "Executive Profile: Charles Hirschhorn". Bloomberg Businessweek. Bloomberg L.P. Retrieved December 30, 2015. For the TV and TV animation group, he was responsible for the Disney Telefilms, including all live-action films airing on "The Wonderful World of Disney" - which he re-launched on ABC in 1997, and also animated series and specials for Disney Video Premieres and Movietoons. ^ a b Littleton, Cynthia (April 23, 1999). "Gurney, Price earn Disney promotions". Variety. Cahners Business Information. Retrieved October 16, 2017. ^ Kilday, Gregg (September 23, 2003). "Dis To Shut Japan Ani Unit". The Hollywood Reporter. Retrieved December 25, 2011. ^ a b c d e Ball, Ryan (September 23, 2003). "Pencils Down at Walt Disney Animation Japan". Animation Magazine. Retrieved September 8, 2015. ^ "Disney to close Japan animation studio in June". Asia Times Online. April 9, 2004. Retrieved December 25, 2011. ^ a b Grimm, Nick (July 27, 2005). "Disney cans Australian animation operation". Australian Broadcasting Corporation. Retrieved April 19, 2012. ^ a b c d Armstrong, Josh (August 14, 2013). "Mike Disa and The Seven Dwarfs: How the Snow White prequel became a Dopey movie". Animated Views.com. Animated Views. Retrieved June 12, 2014. ^ a b c d Hill, Jim (June 20, 2007). "Say "So Long !" to direct-to-video sequels : Disneytoon Studios tunes out Sharon Morrill". Jim Hill Media. Retrieved April 19, 2012. ^ Hayes, Dade (2008-04-08). "Disney unveils animation slate". Variety. Archived from the original on March 12, 2016. Retrieved 2012-01-03. ^ Landy, Heather (November 21, 2017). "Read Disney animation chief John Lasseter's memo to staff about his "unwanted hugs"". Retrieved September 20, 2018. ^ Masters, Kim (November 21, 2017). "John Lasseter's Pattern of Alleged Misconduct Detailed by Disney/Pixar Insiders". The Hollywood Reporter. Retrieved November 24, 2017. ^ Zeitchik, Steven (November 21, 2017). "Disney animation guru John Lasseter takes leave after sexual misconduct allegations". The Washington Post. Retrieved November 21, 2017. ^ Masters, Kim (April 25, 2018). "He Who Must Not Be Named": Can John Lasseter Ever Return to Disney?". The Hollywood Reporter. Retrieved May 1, 2018. ^ Barnes, Brooks (June 8, 2018). "Pixar Co-Founder to Leave Disney After 'Missteps'". The Hollywood Reporter. Retrieved June 9, 2018. ^ "Disney is Shutting Down One of Its Animation Studios". Cinema Blend. Retrieved December 27, 2018. ^ Breznican, Anthony (February 14, 2002). "Disney taking sequels to the bank". Spartanburg Herald-Journal. The New York Times Company. Associated Press. p. D7. Retrieved March 29, 2017. ^ Beck, Jerry (2013). "Animated Movie Guide 3". Cartoon Research.com. Retrieved August 5, 2016. ^ McCarthy, Todd (April 7, 1995). "Review: 'A Goofy Movie'". Variety. Cahners Business Information. Retrieved September 8, 2015. ^ "Pooh's Grand Adventure: The Search for Christopher Robin (1997) Production Credits". The New York Times. The New York Times Company. Archived from the original on March 7, 2016. Retrieved September 8, 2015. ^ a b Poirier, Agnes (February 15, 2000). "Disney pulls plug on Canadian animation studios". Screendaily.com. Retrieved March 23, 2013. ^ "The Tigger Movie (2000) Full Production Credits". The New York Times. The New York Times Company. Retrieved September 8, 2015. ^ a b c d e f g "Disney to axe Sydney studio". The Sydney Morning Herald. Fairfax Media. July 26, 2005. Retrieved March 12, 2013. ^ "Disney Animation closing in Canada". CBC. February 14, 2000. Retrieved March 23, 2013. ^ a b Bloom, David (August 13, 2002). "Cornerstone Animation Takes Hit". Animation World Network. Retrieved March 21, 2017. ^ a b Desowitz, Bill (October 27, 2004). "Japan's New Answer Studio Builds on Animation's Past and Future". VFXWorld. Retrieved December 25, 2011. ^ "The Jungle Book 2 (2003) End Credits". YouTube. DisneyToon Studios. 13 July 2018. Retrieved November 27, 2018. ^ "Pooh's Heffalump Halloween Movie (2005)". Rotten Tomatoes. Fandamgo Media. Retrieved September 8, 2015. ^ a b Moore, Roger (January 31, 2006). "Drawn to the light". Orlando Sentinel. Tribune Publishing. Retrieved March 6, 2018. ^ Strike, Joe (March 28, 2007). "Disney DTV Sequels: End of the Line". ANIMATIONWorld. Animation World Network. Retrieved April 3, 2017. ^ Verrier, Richard (March 29, 2013). "Rhythm & Hues finalizes sale to Prana Studios". Los Angeles Times. Tribune Publishing. Retrieved April 3, 2017. ^ Beck (January 26, 2015). "TRAILER: "Tinkerbell and the Legend of the NeverBeast"". Animation Scoop. Indiewire.com. Retrieved March 7, 2015. ^ "Redux Riding Hood (film)". D23: Disney A to Z. The Walt Disney Company. Retrieved September 16, 2015. ^ "26th Annual Annie Award Nominees and Winners (1998)". Annie Awards. Retrieved September 16, 2015. ^ "The Three Little Pigs". Annecy. Retrieved September 16, 2015.